The specific job of the Forcing Test Refrigerated/Heating Circulating Bath F38-ME is to simulate the beer aging process to determine a “best before” date for bottled beer. 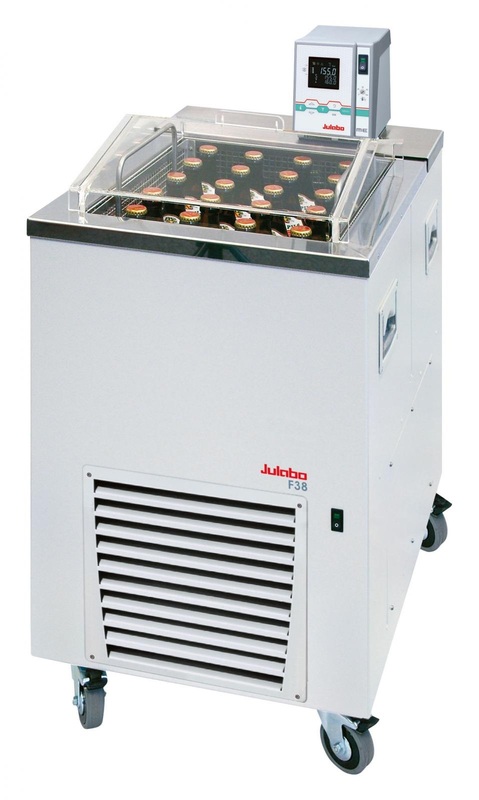 The Julabo Forcing Test Refrigerated/Heating Circulator Bath is employed with a photometer. The beer is aged under a programed temperature cycle treatment that is repeated until clouding is observed. The forcing test is one of the most reliable methods for determining the durability of bottled beer. First a cloudiness test is done with the photometer at room temperature. Afterwards the beer bottles are placed in the bath of the F38-ME and heated for one day, then cooled for one day. The cycle is repeated and the clouding is observed and recorded. The Julabo F38-ME is the standard that is used by breweries around the world that are famous for their bottled beer.